Urinary tract infections (UTIs) drive over eight million people to seek medical attention every year. Almost all — as many as 90% — of those infections are caused by Escherichia coli. Copper can kill bacteria, but E. coli has found a way to capture the copper, preventing its antibacterial action. Now, researchers have found that, in a cruel irony, the bacteria use the copper it grabs as a nutrient to feed its growth. Researchers from Washington University School of Medicine in St. Louis, MO suggest that this isn't all bad news. They believe that blocking the copper-grabbing mechanism may starve E. coli infections and present a way to treat UTIs in a way that works differently from traditional antibiotics. The new finding, by senior author Jeffrey P. Henderson and his colleagues, was published online July 24 in Nature Chemical Biology. A urinary tract infection can occur anywhere in the urinary tract, from the urethra to the kidneys, but occur most often in the bladder. Advanced age, having diabetes, being catheterized, sexual activity, pregnancy, blockage or restriction in the urinary tract, and having a previous UTI increase the risk of the infection. Cloudy and smelly urine, abdominal pressure, increased urgency and frequency of urination, pain on urination, and low-grade fever are all symptoms a UTI is brewing. If the infection moves to the kidney, both symptoms and complications worsen. Fever and pain may increase, and the patient may experience chills, confusion, nausea, vomiting, and fatigue. If left untreated, or not successfully treated, the infection may cause sepsis — a severe and potentially life-threatening immune response to the bacteria — and kidney damage. Simple antibiotics typically cure UTIs. But now, since E. coli has been exposed to so many courses of different antibiotics, the bacteria that become resistant to the drugs and infections are harder to treat. A report on E. coli antimicrobial susceptibility trends in over 12 million E. coli isolates from urine between 2000 to 2010 showed increases in resistance to two drugs commonly used to treat them. In 2000, 3% of infections were resistant to ciprofloxacin. By 2010, the number has risen to 17.1%. Resistance to trimethoprim-sulfamethoxazole over that same time rose from 17.9% of the bacteria isolated to 24.2 percent. E. coli is also becoming resistant to carbapenem. A study of 305 patients hospitalized in the southwestern US found 6% of them were infected with carbapenem-resistant E. coli. For these patients, colistin became the last option for treatment. About a year ago, scientists found a E. coli strain that was resistant to both colistin and carbapenem isolated from urine of a patient with recurrent urinary tract infections. Finding a way to treat E. coli UTIs that didn't rely on antibiotics might give us an advantage when treating antibiotic-resistant bacteria. The discovery by Henderson and colleagues may have found that advantage. Copper has been used for thousands of years to kill bacteria and other microbes. Treatment of bacteria with copper has shown to cause extensive membrane damage to the bacteria within minutes. Henderson's research team has been studying the interaction of E. coli with copper in urine. They had previously found that E. coli secretes a molecule called yersiniabactin that captures copper, preventing it from accumulating to levels that could damage the organism. His new research study investigated what the bacteria does with the copper. "Yersiniabactin is more common in invasive bacteria, including E. coli, that cause the more problematic recurring and antibiotic-resistant urinary tract infections," said Henderson in a press release from Washington University School of Medicine. In the new study, the researchers showed that yersiniabactin binds copper ions and brings them into the cell where biochemical processes within the bacteria dissociate the copper from the yersiniabactin and send the protein back outside the cell to find and import more copper. The copper is then available for use in vital biochemical reactions inside the bacteria. The study also revealed that yersiniabactin also binds iron, nickel, cobalt, and chromium. The traditional idea that yersiniabactin is an iron importer is far too simplistic a view of this molecule. 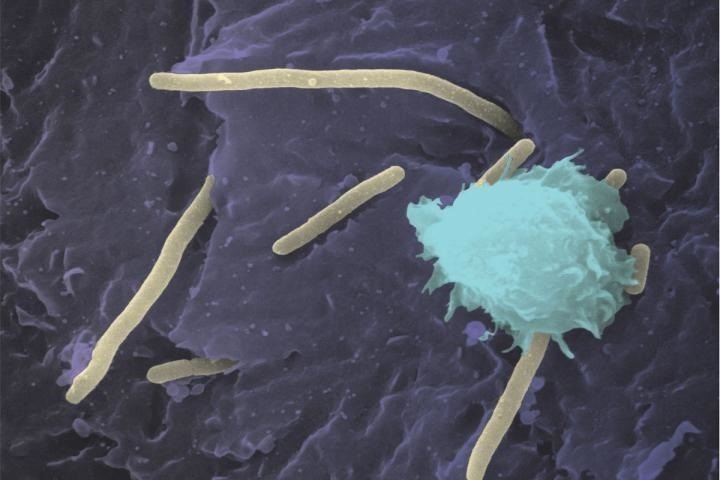 Bacteria that secrete yersiniabactin can bind to all sorts of metals. At the site of infection, this molecule appears to be grabbing onto metals all around it, preventing these metals from reaching toxic levels, but also bringing in controlled amounts of metal ions for nutritional purposes. According to the study authors, metal recycling by yersiniabactin may serve as an efficient and rapid response in host microenvironments where bacteria are confronted by varying metal ion composition. It may also mean that starving E. coli of copper could foil yersiniabactin's efforts to supply nutritional copper to the bacteria, potentially killing or damaging it. Besides presenting a possible target for new treatments of E. coli UTIs, the findings may have further reaching implications. The yersiniabactin molecule is present in other bacteria, notably Yersinia pestis that causes plague, and that may be just the tip of the iceberg.